Photo of a vintage staircase in Chicago. 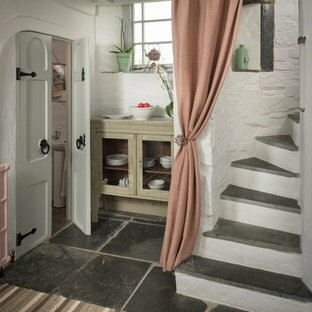 Inspiration for a small shabby-chic style concrete curved staircase in Cornwall with concrete risers. 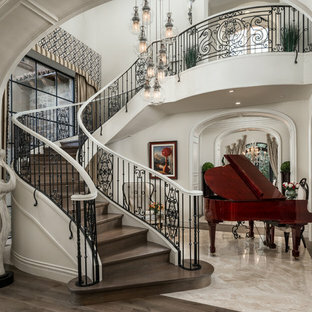 Design ideas for a romantic staircase in Kansas City. 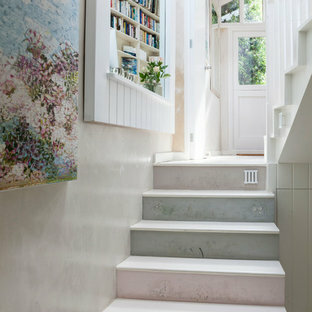 Inspiration for a shabby-chic style painted wood staircase in Los Angeles with painted wood risers. Photo of a vintage staircase in Columbus. This is an example of a romantic staircase in Amsterdam. 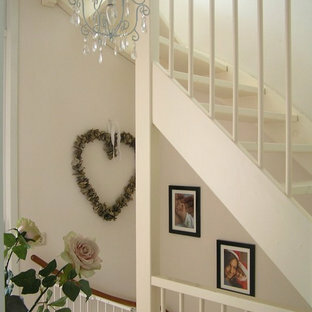 This is an example of a small romantic staircase in London. 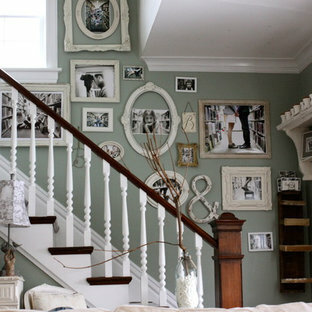 Romantic painted wood staircase in Tampa with painted wood risers. World Renowned Interior Design Firm Fratantoni Interior Designers created this beautiful French Modern Home! They design homes for families all over the world in any size and style. They also have in-house Architecture Firm Fratantoni Design and world class Luxury Home Building Firm Fratantoni Luxury Estates! Hire one or all three companies to design, build and or remodel your home! 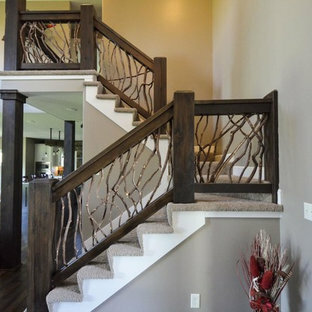 We had the opportunity to help create, lay out, cut and install several beautifully architecturally designed oak staircases for this thoughtfully planned new home. Gleaming oak treads, stunning wooden newels and a floating/sophisticated white oak handrail system, help define the seamless blend of the strong farmhouse home’s character with the amenity-rich modern living spaces throughout the home. CSC © 1976-2017 Century Stair Company. All rights reserved. 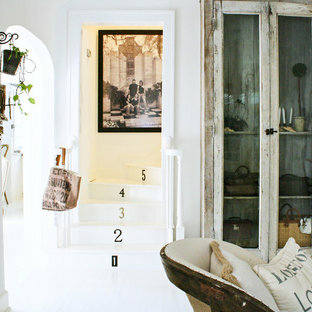 Design ideas for a shabby-chic style staircase in Houston. Photo of a vintage staircase in Tokyo. I found most of these mirrors at thrift stores and flea markets and painted them all a creamy white. This really brightens up my dark staircase. 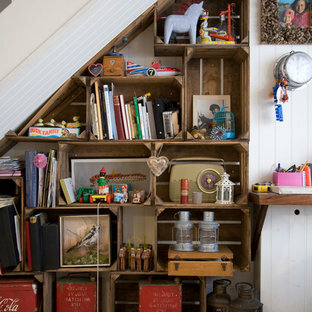 Design ideas for a vintage staircase in San Francisco. 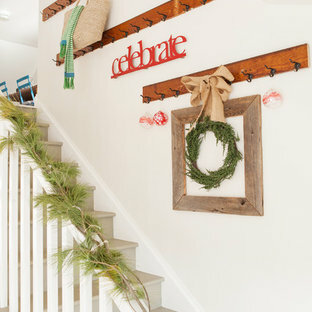 Photo of a shabby-chic style wood straight wood railing staircase in Chicago with painted wood risers. Custom oak radius stair treads that were handscraped, wirebrushed and oiled to match the hardwood flooring. 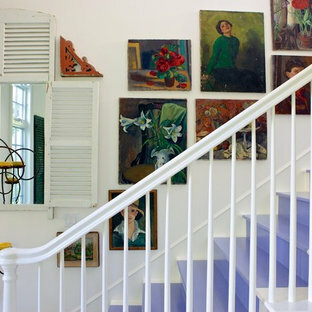 Photo of a large shabby-chic style wood spiral staircase in Miami with wood risers.